One of the early productions that became and instant hit was Canadian Bandstand. 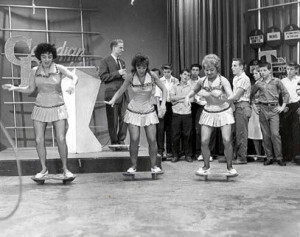 A take-off on the American Bandstand show. 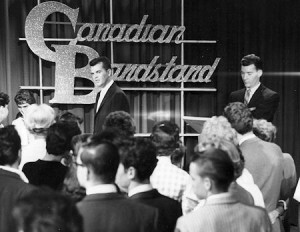 Canadian Bandstand was originally hosted by Wally Crouter followed by Gary McLaren, Ron Hill, Reg Sellner, Peter Emmerson and Grant (Grantly) Hoffman. 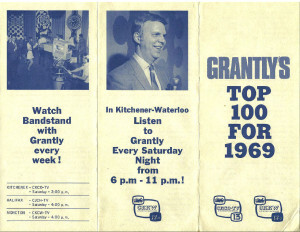 The following are recollections by Grant Hoffman (Grantly) of his time as host of CKCO-TV’s Canadian Bandstand. I had been helping with the production of the show since Reg Sellner took over in the early sixties. 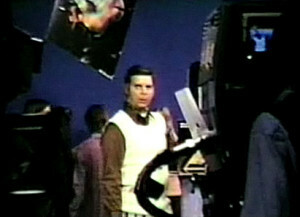 Reg passed the hosting duties on to Pete Emmerson in 1965 at which time, the show started to decline in attendance and popularity. Early 1966, Bruce Lawson, the Program Director at CKCO TV asked me if I was interested in hosting the show. I owned the Colonial Record Shoppe and had a popular radio program geared at the teens in those days and he figured if anyone could revive the show it would be me. At first, I declined but Bruce had a way of changing a person’s mind so I graciously accepted the challenge. We tried everything. The first week, only 4 teens showed up so we decided to miss a week and then after a lot or promotion tried the following Friday night to tape a show. This time we got 8 teens and decided to go ahead and do the show. For 90 minutes, those teens danced and the next week we had about 30-40 teens and from thereon, the show increased in popularity. I went out to the local and area high schools and tried to recruit guests for the following weeks and after a lot of hard work, the show took off. We had bus loads come in from all over the area and soon were turning people away. By this time Canadian Content became a big issue and many CTV stations especially in the Maritimes became interested in the show. We even had one week on Toronto’s CFTO TV but had to cancel because of the Musician Union getting involved. At the end of the first season, I decided to do a show that involved all the local high schools. We would do 3 shows with each high school hosting a 20 minute segment in which they would review their past scholastic year and of course included dancing. It turned to be a barbecue in the parking lot behind the station on a Sunday afternoon. We had a terrific turnout and the show went well. We continued this for the years to come. The first summer, we had a lot of trouble getting teens to come to the studio because mainly of the hot studio lights so the next season I decided to double up the taping of shows. We did a current show, which played back the next day and also taped a second show to be played back during the next summer season. 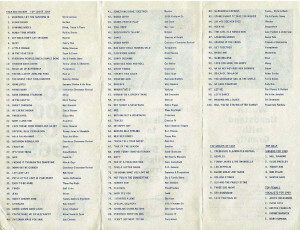 This show featured hits of the previous years (1958 & on). Each week a different year and again this went over well. 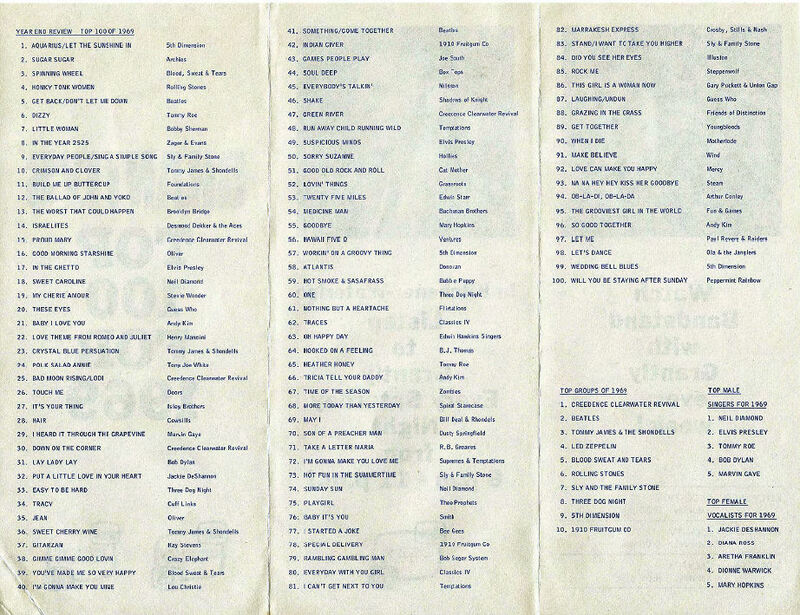 As we approached the early seventies, live bands started to become available and in cooperation with the many record companies, I was able to arrange for various bands to appear on the show. Mostly we taped in the studio on off days and I also received a number of films of artists doing their latest hits from the various record companies. They were very anxious to get all the publicity they could get and also send a large number of record albums for me to give away on the show. I accumulated quite a library of these films and if we had a bad turnout or over a holiday, I had enough material to put together a show using these film clips. I did hour Specials with Edward Bear, Stampeders, Fludd, April Wine, Rush (at St. Catharines) Rain and Copper Penny among others. I also introduced the group America with the first appearance of “A Horse With No Name’ which was one of our best studio productions. We took the show on the road twice. Owen Sound because CKCO TV was opening up their repeater station up north and also to St. Catharines – a show that featured Rush. 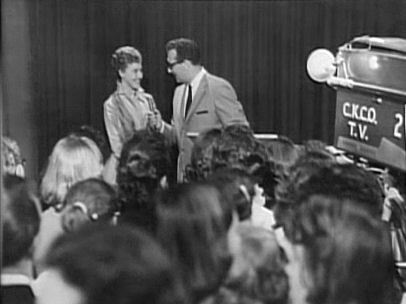 In the early seventies, our ratings soared and CKCO TV decided to air segments daily around 8 o’clock in the morning and over the noon hour to try and capture a teen audience. Our last major production was a year end show in 1974. We had nine high schools and nine live bands arranged. The show was to be taped in the band shell at Waterloo Park on a Sunday afternoon. Around 10 a.m. the weather office advised us of a huge storm expected mid afternoon and right in the middle of our production. We decided to go with our indoor location which was Seagram Gym which held about 2,000 people. By the time we got everything reorganized, the Gym was full and nobody could move, let alone set up equipment and no room for cameras. We had well over 5,000 teens show up for the show and of course had to turn a large number away or have them wait outside in the rain until there was room. Needless to say this took time. We started taping early evening and finished our third show around 5 – 6 a.m. Of course, A huge amount of overtime was paid and I was in big trouble. I did tape three really good shows which we edited and ended up with another two and with repeats, we had 10 shows to end out the year. Needless to say, we were not renewed in the fall. Bruce Lawson passed away that summer and his replacement pulled the plug on Bandstand after 18 years on the air. I really enjoyed my time on the show. Between myself and my Director Jack Alexander, we had a good run. I had a good relationship with the teens. I made them feel welcome by greeting them when they arrived at the studio and to say thanks and goodbye when they left. The following is a story that ran in more than one paper in Canada – at the time Canadian Bandstand was being bicycled around the country so more people in more cities would have known what Canadian Bandstand was all about. Rush band members…..Geddy Lee (Bass and Lead Vocals), Alex Lifeson (Guitar and Backing Vocals) and John Rutsey (Drums and Vocals). This concert occurred in the spring of 1974 just months before John Rutsey left the band and was replaced by Neil Peart.